The site of the Bogle & Scott office and warehouse is now occupied by another St. Andrews, the Catholic Cathedral in Clyde Street on the banks of the Clyde River, between Jamaica Bridge and Victoria Bridge. Michael Scott attended the old Glasgow Grammar School until 1801 and then Glasgow University in High Street, between 1802 and 1805, where he read Latin, Greek and Logic. He matriculated in 1805. (4) While at University, he studied with John Wilson (aka Christopher North) and particularly Thomas Hamilton (later author of Cyril Thornton) with whom he was an ‘inseparable companion’ (5) and maintained a life long friendship. John Gibson Lockhart also attended Glasgow University at this time and later went on to edit the Blackwood’s Magazine and the Quarterly Review. Michael continued under George’s tutelage until 1810, when he entered Robert Bogle’s mercantile house in Kingston. His business, coupled with Hamilton’s friendship, brought him into contact with every level of society in Jamaica and sent him on frequent voyages around the Caribbean. It is these travels and experiences that formed the basis of the events and places he describes so vividly in the ‘Log’ which, in the days before photography and television, found avid readers in both Britain and Europe. In 1817 he married, in Glasgow, Margaret Cathcart Bogle, daughter of the aforementioned Robert Bogle of Gilmorehill, Merchant in Glasgow and Jamaica. Margaret was also his first cousin once removed i.e. granddaughter of Michael Bogle and Janet Scott. Michael and Margaret returned to Jamaica for a short period between 1820 and 1822. In 1822 Michael Scott returned to Glasgow as a Merchant on his own account with offices in both Glasgow and Maracaybo, Colombia on the Spanish Main (now South America). He and Margaret established their household at Atholl Place in Bath Street and another in the country at ‘Birselees’ on the banks of the River Ale near St Boswells and Melrose in Roxburghshire. The father of his biographer, Sir George Douglas, who acquired Birselees after Michael Scott’s death attests that parts of the Log were written at Birselees. (11) Thomas Hamilton, his close friend from university days had married in 1820 and lived for some time at ‘Chiefswood’ near Melrose, and was a frequent visitor at Sir Walter Scott’s home ‘Abbotsford’ (12) as was Christopher North and another Glasgow alumni, John Gibson Lockhart, who eventually married Sir Walter Scott’s daughter, Sophia. Incidentally they also lived for a time at Chiefswood. It is not unreasonable to assume that Michael, who shared similar interests and friendships with all, was also included in the group gatherings at Abbotsford. 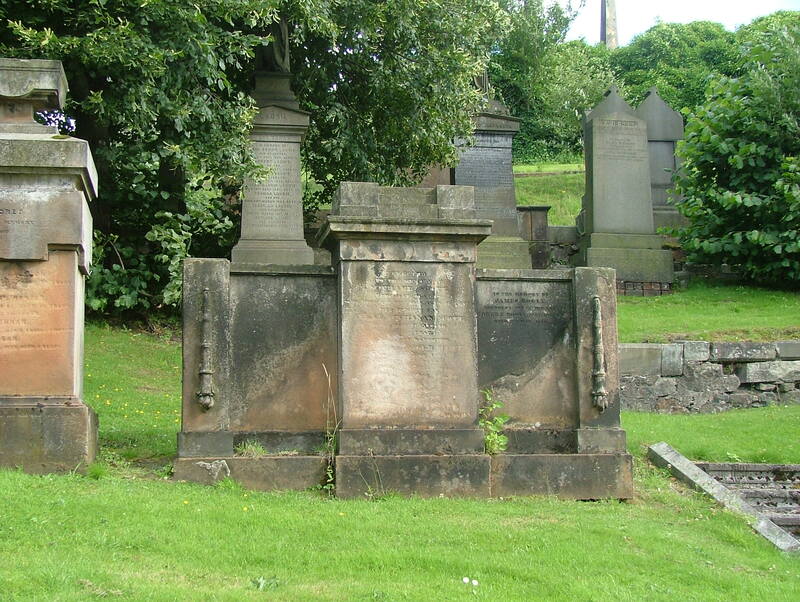 Although they never met, Michael Scott and William Blackwood formed a close relationship over the many years they corresponded between Glasgow and Edinburgh. Michael counted William as his literary counsellor and a valued friend. The inscription is now all but lost. 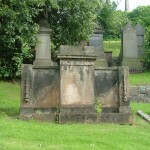 Buried next to him is his brother-in-law and close friend James Bogle, son of Robert Bogle of Gilmorehill. James actually lived at Atholl Place with his sister, Margaret Cathcart Bogle until he died on 3rd May, 1855. James Bogle occupied at intervals, high public office as City Councilor and Magistrate and was Lord Dean of Guild between 1846 and 1848. (16) Michael Scott is also commemorated in the “Poets Corner” at the Royal Botanic Gardens at Hope in Kingston, Jamaica. Michael Scott and Margaret Cathcart Bogle had nine children.